The mood was somber and the message was powerful at a community vigil June 23. 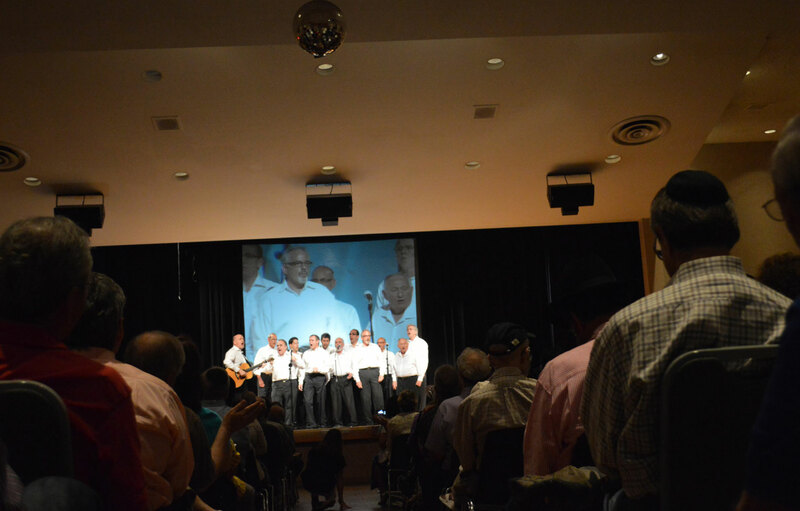 Nearly 600 people of all ages gathered to pray for the safe return of three Israeli teenagers kidnapped by Hamas June 12. Gilad Shaar, 16, Eyal Yifrach, 19, and U.S. citizen Naftali Frenkel, 16, were abducted on their way home from school. They were last seen trying to get rides from their Yeshiva high school in a bloc of settlements located South of Jerusalem. A search has been underway to find them ever since. The vigil was organized by the Jewish Federation of Greater Dallas, agencies and synagogues. Federation Board Chair Cindy Sweet Moskowitz said it is our duty as Jews to unite and show support for these teenagers and their families. During the evening, Raquel Gershon led the crowd in the national anthem and Hatikvah, while Kol Rina, the Congregation Anshai Torah men’s choir, sang “Akheinu” and “Bring Back Our Boys.” Rabbi Debra Robbins of Temple Emanu-El and Rabbi Andrew Paley of Temple Shalom each shared thoughts as well, and led the reading of the Prayer for the Captives and Psalms 130, respectively. In his remarks, Rabbi Howard Wolk, president of the Rabbinical Association of Greater Dallas, said each of us has the power to do something more to help bring the boys home, whether that be additional prayer, reading psalms, lighting Shabbat candles or doing mitzvot. Guests at the vigil also had the opportunity to take their photo with a sign that read “#Bring Back Our Boys” and then post it on their social media pages. This is one of the steps that can be taken to show support locally. Something like this is personal for everyone, according to Maya Kadosh, the deputy counsel general of Israel based in Houston. She flew in Dallas for the evening and highlighted the importance of this situation. She said there are so many ways to show solidarity and the outpouring of support from people around the world has been amazing. Sign a letter of unity to the families of the teens, at bringbackourboys.net. Like and share Bring Back Our Boys on Facebook; tweet #BringBackOurBoys and #EyalGiladNaftali. Share a photo of with a #BringBackOurBoys sign. Write and Op-Ed piece or letter to the mainstream media. Call the White House comment line at 202-456-1111, on behalf of Naftali Frenkel, a U.S. citizen, explaining that they boys were kidnapped and for the White House to take action. Keep informed on the situation, then educate friends and family, by visiting the following pages: Israel Ministry of Foreign Affairs, Embassy of Israel to the U.S. and the IDF Facebook page. Two very simple songs with a very important message — Peace! The songs are not about what peace is but express the hope that peace will be ours. How do we create a time when the world will be at peace? What can we do to make the world a more peaceful place? Is there something we can do to make the appointed time NOW? The music for “Salaam” comes from Moshe Ben-Ari of the Group Sheva and “Ki Va Moed” is music from Shlomo Carlebach. Rick Recht arranged both in very rhythmic songs. Peace to us and to all the world. The appointed time (of peace) has come. The energy we feel when we sing this song makes us believe that we can bring a peaceful time. It is up to each of us. Another special feeling that singing gives us is the feeling of belonging to community. Can we bring peace alone? We can do our part but we need each other. We need to be part of community to work together. Lo yi-sa goy el goy he rev, Lo yil-m’du od mil-ha ma. And into plowshares beat their swords and nation shall learn war no more. Shalom, from the Shabbat Lady. Jerry practiced his Haftorah with his “beloved” Rabbi Shawn Zell for several weeks prior to this special birthday. During his birthday week, various festivities took place as he celebrated with Diane; his seven sons: Andrew Benjamin, David Benjamin, Richard Benjamin, Stuart Wernick, Bruce Wernick, Barry Wernick and Ephraim Wernick and their families, along with other out-of-town family members, his Jewish War Veterans pals, his poker buddies as well as friends who enjoyed the festivities of the week. Jerry is a national executive committee member and past department commander of the Jewish War Veterans of the United States; a member of the board of Tiferet Israel Congregation; a Dallas County Election judge; a Bronx High School of Science alum and devotee; a Brooklyn College graduate and proud father of seven sons and 12 grandchildren. The Benjamins felt blessed to have shared so many wonderful memories and his special milestone birthday, surrounded by well-wishers all. Jerry was further delighted with the many contributions made in his honor to his favorite organizations made in his honor. 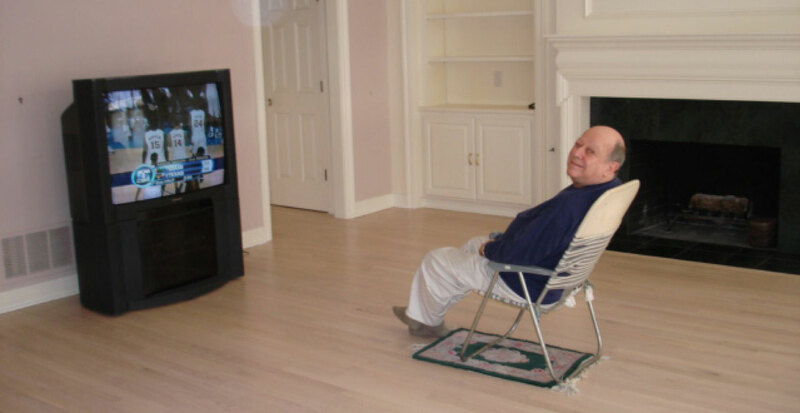 For the record, I’ve heard that Jerry’s children bought him a new 65” television to replace the 25-year-old relic. Happy Birthday, Jerry! Diane Benjamin has been elected president of the Texas region of the Bnai Zion Foundation (bnaizion.org), succeeding David H. Eisenberg. Diane has served the real estate needs of the Dallas community for 35 years and is an active member of several local congregations. She has received numerous awards for her civic involvement and has served as a City of Dallas commissioner for environment and health services, and as a senior affairs commissioner. Diane has also been on the board of directors of the Dallas chapter of Hadassah (recipient of its National Leadership Award, recognized on its Scroll of Honor) State of Israel Bonds (Women’s Division) — chairman, Woman of Valor awardee and on the boards of Jewish War Veterans, the Aaron Family JCC and many more organizations. Bnai Zion supports five humanitarian projects in Israel that improve the lives of thousands in need, and 100 percent of all designated gifts to Bnai Zion are transferred to its projects in Israel. For further information please contact Avrille Harris, Texas region executive director, at 972-918-9200 or avrille.harris-cohen@bnaizion.org. Good wishes to Kayla Anne Rodenberg, daughter of Michelle Rodenberg, who received the Diamond Award, the highest award in Frontier Girls, on Tuesday, May 20. Kerry Cordy, Frontier Girls’ founder, presented the award to the recipient. Kayla Anne Rodenberg — recent Mesorah graduate and Frontier Girls Diamond Award recipient. The Diamond Award acknowledges girls for going above and beyond the basic obligations of attending meetings and by earning badges — as well as rewarding their efforts to take to heart the most important aspects of the Frontier Girls program — by being a woman of honor. To earn her award, Kayla Anne had to learn her Life Skills Achievement Award, Liberty Award, Fruit of the Spirit Award, Leadership Award, Make-a-Difference Award, a minimum of one Servants’ Heart Award for community service and at least one badge from each of nine Areas of Discovery. While earning her Diamond Award, Kayla Anne completed over 225 hours of community service, and earned over 100 badges, for which she received The Frontier Girls’ WOW Award. As part of her Make a Difference Award, Kayla Anne chose to plan the mother -daughter luncheon at Mesorah High School. The event had not been held at the school for several years, so she re-created the affair from scratch, leaving her how-to plans so the event can be held again for years to come. The Diamond Award was presented at Data of Plano, which sponsors Kayla Anne’s troop. In attendance were many family members and friends, troop members with their families, her troop leaders, Chana Barak and Aimee Wortendyke, and the founder of Frontier Girls, Kerry Cordy. Following a brief welcome, Kayla Anne’s troop leaders made speeches about her hard work, achievements and inspirational dedication. Cordy then gave an overview of Kayla Anne’s many accomplishments prior to the presentation of her awards, which included a personalized Frontier Girls necklace, and her pins for advancing to the adult level of Frontier Girls. Following the formalities, refreshments were served as photos were taken, and Cordy visited with each Frontier Girl and their families. 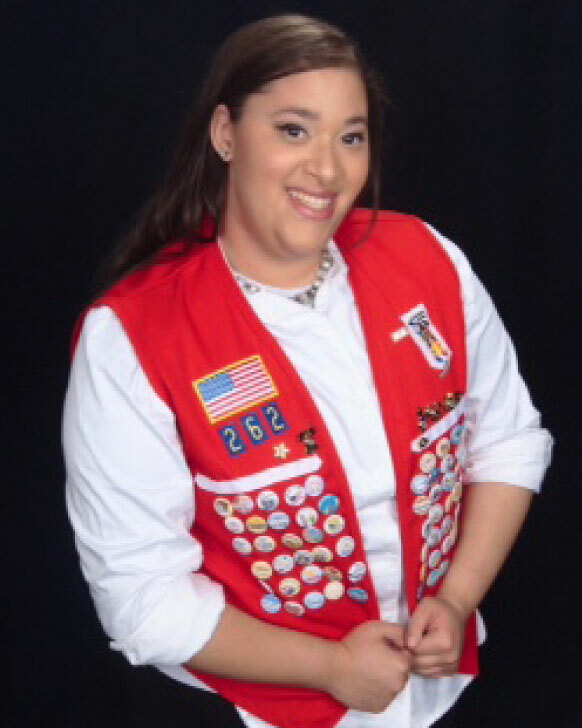 Kayla Anne joined Frontier Girls troop 262 as a founding member in 2013. She held leadership positions of snack coordinator and leader in training. Kayla Anne is 18 years old and graduated from Mesorah High School earlier this month. She will study at Bais Yaakov Levavi in Israel for a year before returning to the U.S. to attend Touro College in New York. “Frontier Girls isn’t just a place to gain your own leadership skills, but to help others find the best way to gain their leadership skills,” said Kayla Anne. For more information on Frontier Girls, please visit, www.frontiergirlsclubs.com. Additional information on Frontier Girls Troop 262, can be obtained by contacting: Chana Barak at chana.m.barak@gmail.com or Aimee Wortendyke at awortendyke@gmail.com. I dipped into nostalgia last week while remembering two old family recipes, and ever since, I’ve been encountering it everywhere. First, there was a glorious but sad piece by my very favorite columnist of all time, Paul Greenberg, the venerable Pulitzer Prize-winning editorial page editor of the Arkansas Democrat-Gazette. He writes regularly on a variety of personal subjects; this time, he was bemoaning a recent weekend return to Shreveport, La., where he was born and raised. There is plenty of waxing poetic in that story, about nobody having to lock doors, and kids playing “kick- the-can” out in the street until it got dark — after which they brought out jars for catching fireflies. And then — lo and behold! — I found virtually identical sentiments expressed, even in some of the same words, in a last-week letter to the editor of the Dallas Morning News! I also grew up in that kind of neighborhood; I think our world changed when folks started driving everywhere instead of walking, when front porches became extinct and privacy fences kept the next door “neighbors” from seeing you, or you seeing them, as you were both outside doing the same things at the same time in your backyards When folks stopped walking to shul Friday evenings, so were no longer asked in for coffee and cake by families you passed on the way home. I often visit my growing-up street. Where we used to play kick-the-can is now “paved over,” as Paul Greenberg says, but with parked cars. And so the kids are inside, gaming on their hand-held devices. Nostalgia makes me feel sorry for them. Besides praying, what do you think we should be doing for the three kidnapped boys in Israel? First, allow me to focus on the outlook we should have with our prayers. The Talmud teaches us that when Jews are in pain anywhere, the entire Jewish people need to rally to their pain, as it is not considered just their pain, but we share in it as their extended family. In a spiritual way all Jews are considered as one, so it’s not just their problem but all of our problem. In this way we need to find ways to identify with the pain of these families. When Moses was praying for the Jews at the time they were at war with the Amalakite nation he was observing from a hilltop, standing with his hands raised in prayer. When he became tired and could stand no longer, he asked to be brought a large rock to sit on so he could continue to pray. The Talmud raises the obvious question; Moses was the king of the Jews, couldn’t he sit on a chair?! The answer is that Moses felt that when the Jews below are in a dangerous situation and in the throes of war it is inappropriate that he should sit in comfort. Rather he should sit in a way which would help him identify and appreciate the feelings of the soldiers at that time. When the revered Rabbi and Rebbetzin Ahron Kotler were miraculously redeemed from the Nazi death clutch they made it to America during the war. Rabbi Kotler barely slept the next years until the end of the war, making Herculean efforts to raise funds to save Jews in Europe, even driving on the Sabbath to raise money. Similar stories of great Jewish leaders abound. They all teach us the same important lesson: when a Jew somewhere in the world is in pain it is all of our pain, especially when the reason for that pain is simply because that person is a Jew! This outlook will greatly affect the way we pray for these boys. We need to use this situation as a time for introspection; how much do we really feel part of and connected to every Jew? How would we pray if the ones affected would have, God forbid, been our own children or siblings? The great Jewish leader of the past century, Rabbi Moshe Scherer, once commented on the custom to cover our eyes when reciting the Shema. The simple reason is that we should have more concentration. R’ Scherer added his own explanation: when one cries out “Shema Yisrael” with his eyes open, all he or she can see are the Jews in the room, in that shul. But when one exclaims “Shema Yisrael” with his eyes covered, he can see all the Jews throughout the world! We need to cry out with sincere prayers like it were our own family members in danger; for it truly is. We need to also add some mitzvot we might have not performed otherwise in the merit of these boys. The greatest mitzvah of all is add more times of Torah study in their merit, which rises above all. May the Almighty hear our prayers and deliver these boys speedily, in good health and spirits, to their families and communities and may the togetherness we feel at this moment across the Jewish spectrum remain long after this ordeal is over. We talk about it in passing, we daven the words, but it’s always special to see true l’dor v’dor in action. 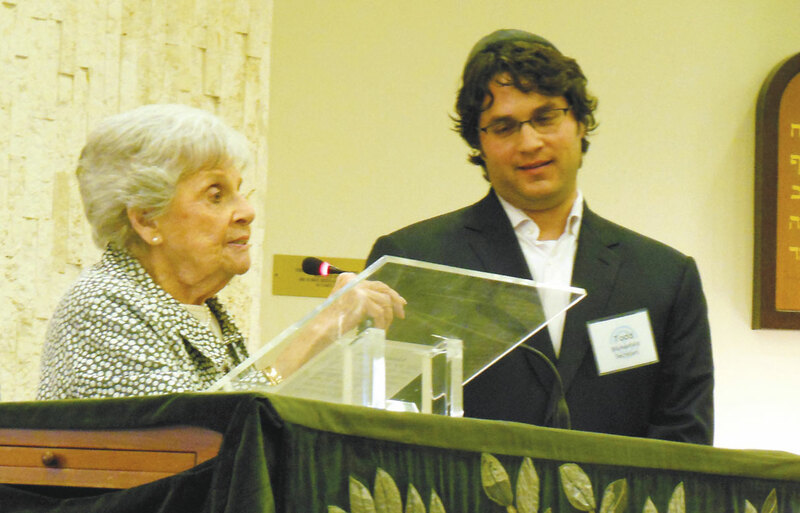 These words were embodied at the Federation meeting June 12 when Roz Rosenthal presented her grandson Todd Blumenfeld with the Jerry and Sylvia Wolens award. As I’m sure most of you know, Jerry and Sylvia Wolens, both of blessed memory, were Roz’s brother-in-law and sister-in-law. Todd was born in Silver Spring, Md. to Sharon and Steven Blumenfeld. Todd’s mother was born in Baltimore to Edward and Faye Jalowsky, both Holocaust survivors from Poland who met in a Displaced Persons camp after WWII. His father was born and raised in Chicago by his parents Leo and Natalie Blumenfeld. Todd’s parents met in Israel in 1971 while both studying abroad. Todd attended high school at The Bullis School in Potomac Md. playing varsity baseball and basketball. He then attended Tulane University where he earned a B.S. in management and marketing from the A.B. Freeman School of Business. While at Tulane Todd met, and fell in love with, Ashli Rosenthal. After graduation they moved to New York City and Todd worked for RCA Records for five years, the last three of which he spent splitting time between working and earning a law degree at the Brooklyn Law School. He graduated with a J.D. from Brooklyn Law School in 2008. After graduating, Ashli and Todd, who were newly engaged, moved to Fort Worth. Todd began working for Friedman, Suder & Cooke, P.C., where he still works as an associate attorney today, focusing on patent litigation and contract drafting and negotiation. Ashli and Todd were married Nov. 8, 2008. Their first child, Elanor, was born April 3, 2011 and their second child, William, was born July 21, 2013. The family also has a dog named Theodore. Todd joined the Federation board in August 2012 and the executive committee in May 2013. Ashli and Todd are both active in a number of other nonprofit and charitable organizations throughout Fort Worth. President Jeff Hochster led the meeting, which was well attended, including all five Tarrant County rabbis — Ralph Mecklenburger (Beth El Congregation), Dov Mandel (Chabad of Fort Worth), Charlie Cytron-Walker (Congregation Beth Israel), Andrew Bloom (Ahavath Sholom) and Levi Gurevitch (Chabad of Arlington). Jeff gave a state of the Federation address, encapsulating the past year. 1. Am I or We doing all that can be done for the community as far as time and resources? LEFT: Rabbi Andrew Bloom gave a d’var Torah at the Federation annual meeting. RIGHT: Alex Nason shared his story of exodus from the former Soviet Union. Rabbi Andrew Bloom delivered a d’var Torah and Cynthia Gilbert, outgoing chair of Jewish Family Services reported on the work of JFS and its plans for future growth, had Meredith Arms elected as a new member of the JFS committee and welcomed Alex Nason in as the new chair of the JFS committee. 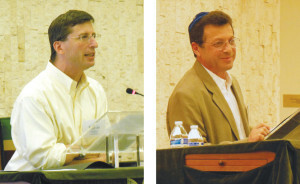 The Federation nominating committee, chaired by Marilyn Englander, recommended the following who were approved to join its board of directors for three year terms: Auryn Goldman, Dr. David Klein, Dr. Daniel Oshman, Diane Kleinman, Rebecca Cristol, Howard Rosenthal, David Nudleman and Jeff Rothschild. The nominating committee also recommended the following officers, which were approved for one year terms: Jeffrey Hochster, president; Lon Werner, vice president/campaign and allocations; Karen Kaplan, vice president/administration; Robert Simon, vice president/community relations; Sheldon Levy, treasurer; and Todd Blumenfeld, secretary. Alex and Sophia Nason shared their harrowing experience emigrating from the former Soviet Union. Essentially, they are the Federation in action. Kol ha Kavod to the Federation. May you continue to grow from strength to strength and generation to generation. I greatly enjoy your weekly columns. In fact, Rabbi Akiva Tatz goes so far as to say that belief in “luck” is anti-Semitic. His reasoning is that “luck” actually requires randomness, fortuitous type “chance” and an assumption that nobody/nothing is in charge. Judaism’s core is “Ad-noy Ehad,” “ein od mi lavado” etc. HaShem IS the very fabric of all there is, and is continuously re-creating all as well. Luck is a contrary belief to HaShem’s omniscience. I’m sure you know all that, but I write just because I always find it interesting when our language, even of trivial phrases, runs against our actual understanding. It is simply because there isn’t really a normally used English closing for best of success other than best of luck, so I have used it; not without some amount of cringing for the reason you correctly cite. So now that you have called it to my attention, I see I need to revert to some other closing which is not misleading, and thank you for the wake-up call! While we’re on the subject, it’s very true that our common language is saturated with terminology, which runs strongly contrary to our beliefs, and we use it, without much or any thought, because it is the vernacular. I’ll cite a couple of common examples which I often notice. One is “knock on wood.” It is done to ward off “bad luck,” or to make sure nothing negative happens. The origin of knocking on wood for this purpose is believed by some to be from early pagan mythology. Wood gods, or dryads, lived in trees, and people would go to them for blessings and to prevent bad luck. Some pagans thought that trees were the homes of fairies, spirits, dryads and many other mystical creatures. In these instances, people might knock or touch wood to request good luck, or to distract spirits with evil intentions. When in need of a favor or some good luck, one politely mentioned this wish to a tree and then touched the bark, representing the first “knock.” The second “knock” was to say “thank you.” The knocking was also supposed to prevent evil spirits from hearing your speech and as such stop them from interfering. Alternatively, some traditions have it that by knocking upon wood, you would awaken and release the benevolent wood fairies that dwelt there. Some feel it is to invoke the cross, made from wood. Another is “keeping your fingers crossed.” There is some evidence to suggest that the origins of the gesture are founded in early Christianity, both as a plea for divine protection and as a covert signifier of Christian belief. Modern usage, however, is almost exclusively secular and considerably more diverse in meaning, but using a sign with its origins in the cross is certainly not a way for a nice Jewish boy or girl to express themselves! These are the more obvious examples. The more subtle examples are much more difficult to discern. These involve concepts which are Jewish ones, but the understanding of such concepts by the typical Jewish member of western culture are deeply affected by that culture. This can often cause us to replace Jewish understandings of key concepts with Christian ones which are completely at odds with our Jewish beliefs. This goes as deeply as our understanding of such core concepts as heaven and hell, and even our definition of God. It is beyond the purview of this column to delve into the differences between the two. But I have found that most Jews envision hell as a place of fire, devils and pitchforks which are controlled by the forces of evil or by a vengeful, angry god, enjoying the spectacle of the person burning in his eternal damnation. Although this is the common western vision of hell, nothing could be further from our understanding of hell, although the same word is used by both cultures. The usage of the same word misleads many to assume we all believe the same thing. The same thing would apply to the understanding of God. You could have a room full of people all saying they believe in God. But what many in the room will define as their belief in God would, undoubtedly, be considered blasphemy in the eyes of Judaism and the 13 principles of Maimonides which clearly define our Jewish beliefs. The only solution to get straight what we believe as Jews is through the study of Torah, and in particular those Torah-based works which define our core beliefs. One example would be Rabbi Aryeh Kaplan’s “13 Principles” (NCSY Press). Another would be “Pathways” on www.aish.com, or the teachings of my friend and colleague Rabbi Akiva Tatz, whom you mentioned, who provides a deep and profound level of insight in the key Jewish concepts. His lectures can be downloaded from www.simpletoremember.com. Thanks again and continue your studies! This was a Tycher Library book group meeting, which usually attracts a crowd. But the small number who attended for “Apricots” (including two who flat-out hated it, one of whom said she couldn’t even finish reading it!) attested to its difficulty. It’s full of harsh themes, including self-mutilation (in this case, “cutting”), non-communication and parental neglect. But the glue that holds everything together here is food! The story is told first-person by two alternating protagonists: young Lorca, whose emotionally stunted mother is a chef; and elderly Victoria, who once, with her late husband, ran a restaurant. Lorca has almost literally grown up in the kitchen. Trying to wring some love from her cruelly cold mother, the girl is determined to find instructions for making what she’s learned is mom’s favorite of all dishes: something called masgouf. Now, if you just Google that word, you’ll have no trouble learning it’s the name of a fish from the Tigris, often served in restaurants in and around Baghdad. And you’ll also learn exactly how to prepare it. But Lorca does not Google; she couldn’t, because if she did, the author would have no tale to tell! Instead, Soffer sends her on a search for the recipe, a journey that begins with secretly raiding her mother’s private nooks and crannies, and ends in her meeting Victoria, an unhappy New Yorker from Iran who‘s eager to share the beloved foods of her homeland. The final lesson for Lorca is not embodied in the fish, but in the belated knowledge that what her mother really loved wasn’t masgouf; it was the memory of the wonderful family atmosphere in the restaurant where it had once been served. All of this made me think about the importance of my own family’s old recipes. Sometimes a food can be properly prepared only by the one who originated its preparation. I know this because my Boubby the Philosopher made sour cream kichel, and my mother made steamed chocolate pudding, and although I have both original recipes, including step-by-step instructions, I cannot bring to the table anything that even faintly resembles what those two women used to serve. My Boubby would roll out a plain and simple dough, then cut it into large, largely irregular shapes with a sharp knife. What later emerged from her oven was pan after pan of pale, airy cookies, just perfect for dunking in oversized mugs of coffee. When I try, I get hard, dark discs that MUST be dunked in coffee just to render them chewable. My mother’s steamed chocolate pudding wasn’t what anyone usually thinks of as pudding; it was a tall, porous cake, made to slice and serve in bowls that can accommodate the pouring over of much cold milk. With that addition, the cake turns into its title. But even with the very pot in which my mother used to steam this favorite dessert — an ancient, three-cornered piece of Club Aluminum — I always pull from my oven an ordinary cake, so dense that it’s unable to absorb anything. Others in my family have also tried to replicate these foods, also repeatedly, also with similarly unsatisfactory results. So, I must conclude that there’s a missing ingredient: the special love those two women could incorporate into their own creations. If you’d like to try making sour cream kichel or steamed chocolate pudding, I’ll happily share their recipes. And if masgouf sounds good — Google away. But remember: whatever spells love for you today may become the metaphorical apricots of your own family’s tomorrow! As the days pass following the abduction of three Jewish teenagers near Hebron, the boys’ families are refusing to succumb to despair despite the uncertainty surrounding the situation. Hamas terrorists kidnapped Gilad Shaar, 16, Eyal Yifrach, 19 and Naftali Frenkel, 16, Thursday night, June 12, while they were hitchhiking home from school, Israel has said. A massive manhunt has been underway since Friday, June 13 to rescue the teens. 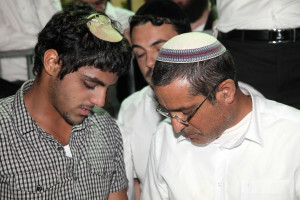 The Shaar and Frenkel families thanked the people of Israel for the waves of support they have received. Prime Minister Benjamin Netanyahu’s wife, Sara, also visited the homes of the families Sunday, telling the parents that she was deeply moved by the strength of their spirit. Meanwhile, social services provided assistance to the immediate and extended families of the abducted teens. “We arrive during the most intimate and difficult moments, offer our help, and leave the decision up to the family. In emergency situations like terror attacks we usually wait,” social worker Ariela Segal said. Social workers visited the boys’ schools to help explain the situation to their classmates, said Segal. Nitzi Yakov, Shlomi Diaz, Shlomo Cesana, Yael Barnovsky and Ilan Gattegno contributed reporting. Kudos to Todd Aaron, vice chairman of Stevens Transport, who was recently named a finalist in Ernst and Young’s Entrepreneur of the Year Award. Todd, son of Carol and Steve Aaron, is a solution-oriented visionary and tenacious sales executive who is revered by his customers and feared by his competition for his strategic leadership, business acumen and market proficiency. As one of the longest tenured employees at his father’s company, Todd has played an instrumental role in facilitating the organization’s growth to an industry-leading refrigerated carrier; however, his path to success has required patience, innovation and perseverance. Within his first few years of employment, Todd solidified Stevens Transport’s international footprint by installing key satellite offices in Laredo, Texas; Celaya, Mexico; and Bridgnorth, Canada. When the Celaya office was established in 1990, Stevens Transport became the first U.S. refrigerated carrier to haul freight into Mexico. That same year, Todd recruited a general manager to operate a logistics dispatch office in Bridgnorth of Ontario, Canada to allow his customers to infiltrate decisive international markets north of the American border. By his 10-year corporate anniversary, Todd created a groundbreaking transportation division to increase freight volume and reach new markets with the use of fewer resources. In 1994, Todd partnered with nearly all major U.S. railroad companies including BNSF, Union Pacific, Norfolk Southern and CSX to form the Intermodal Rail Division. Utilizing the U.S. rail infrastructure to transport cargo has played a critical role in helping Todd grow business alliances with his customers, and reach extraordinary levels of capacity for Stevens. Todd’s initiatives continue to push the envelope to acquire market control and his Intermodal Rail Division presently accounts for nearly a quarter of Stevens Transport’s annual revenue. 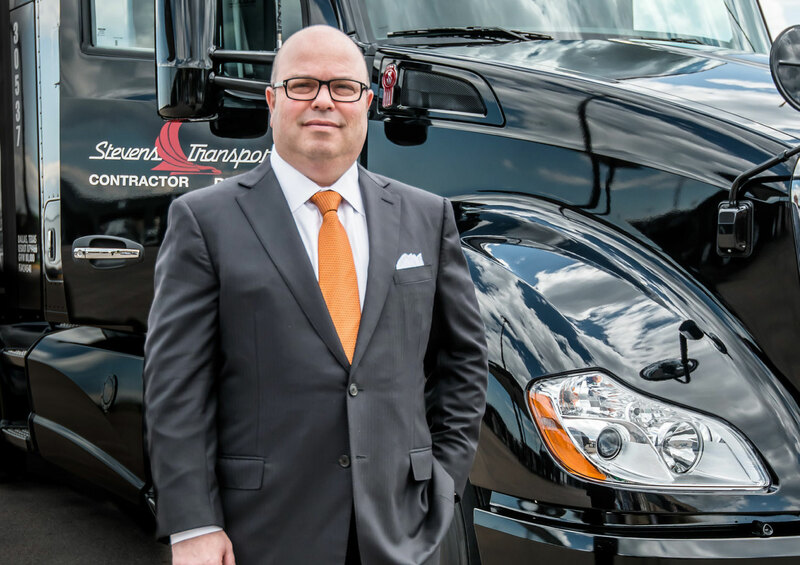 Steve Aaron founded Stevens Transport in 1980 with a small fleet of 10 commercial trucks in Dallas and more than 20 years of work experience in the perishable foods industry. As luck would have it, the U.S. Government enacted the Motor Carrier Act of 1980 to deregulate the transportation industry and spurn competition. As Todd graduated from the University of Texas in 1984, Steve moved his emerging empire to a larger campus and hired Todd as a sales trainee. After his first year of employment, Todd received Stevens Transport Rookie of the Year honors for his remarkable efforts to acquire a record number of new customers and has since guided the Stevens sales force as executive vice chairman and director of sales and procurement. Since its inception, Stevens Transport has remained a privately owned and operated family business. In addition to Todd’s invaluable ingenuity, his father and two siblings have all played monumental roles in Stevens Transport’s success. Clay, Todd’s only brother, has worked at the company in a number of operations and logistics management roles for more than 22 years and currently serves as president. Angela, Todd’s sister, has directed the recruiting efforts at Stevens Transport for more than 23 years, enlisting more than 2,000 new drivers in the Stevens Training Academy annually, and she currently serves as vice president of driver resources and administration. In 2012, Todd’s children joined Stevens Transport upon college graduation. Morgan, Todd’s oldest child, works as a key member of the human resources recruiting division, and Todd’s only son Bennett, currently serves as a special projects associate with the goal of driving efficiencies and promoting continuous improvement initiatives across all departments. During the recession, Stevens’ customers were forced to reevaluate all business expenses, including transportation costs, to maximize profitability. Todd credits his father for his keen focus on cost containment as protection against fluctuating markets. By keeping a close eye on the bottom line, Stevens Transport has afforded itself extreme financial flexibility to withstand imminent economic downturns. Although the recession affected all sectors of the U.S. economy, demand for Stevens Transport’s services remained constant because the global need for perishable foods and pharmaceuticals never subsided. The Aaron Family is proud to affirm that Stevens Transport has never had a layoff in the history of their company, but most importantly, Stevens has provided tens of thousands of individuals with on-the-job training, a compassionate and responsive support staff and rewarding careers in a variety of logistics positions. Todd contributes on a global level in support of his ancestry and heritage. His broad list of beneficiaries include the Aaron Family Jewish Community Center, the Dallas Holocaust Museum/Center for Education and Tolerance, the American Israel Public Affairs Committee (AIPAC), Jewish Family Service and numerous other causes and organizations. In 2008, Todd and his wife, Dawn, established the Todd and Dawn Aaron Endowed Presidential Scholarship in Jewish Studies to afford underprivileged students the opportunity to receive a higher education from the University of Texas at Austin. Furthermore, Todd supports organizations such as Zeta Beta Tau Fraternity, Hillel and Chabad to offer young adults resources and support to live wholesome and richer faith-based adult lives. Since assuming an adviser role for his alma mater organization in 2004, Todd has helped double the fraternity’s annual enrollment to nearly 200 undergraduate brothers, making Lambda the largest Zeta Beta Tau chapter in existence and one of the largest student organizations at the University of Texas. Through Todd’s leadership, Zeta Beta Tau has been recognized as one of the foremost contributors to charitable causes among all national fraternity chapters. Todd’s entrepreneurial spirit, strategic direction and social efficacy has positively influenced countless lives, but his impact on his family and community remain among his most noteworthy and meaningful achievements. Over the past five years, Todd has led significant campaigns to recruit returning U.S. servicemen into the logistics industry and install cutting-edge computer units in every Stevens Transport truck to more efficiently manage driver productivity. In 2012, Todd spearheaded the largest investment of new computers and technology in company history by updating and upgrading nearly all employee workstations with the latest hardware and software. By concentrating on his staff, Todd has been able to promote a family-oriented and team-centric corporate culture. Company-sponsored events such as quarterly catered lunches, driver appreciation days, the annual Christmas party and department extracurricular social activities have served as optimum team-building opportunities. Todd recently approved a blueprint to construct a multimillion dollar wellness facility with a café, gym, locker rooms, retail store and full driver logistics experience. Todd’s passionate spirit and unwavering commitment to push the boundaries of the transportation and logistics industry has provided his company, family and community with invaluable resources to achieve previously unimaginable heights. Please send your news, notes or simchas to lindawd@texasjewishpost.com.